In the digital age, if there is anything we can certainly count on, it is that the Japanese will find new, strange, and totally fascinating ways for us to use technology. From pillows that give kisses to virtual girlfriends, our overseas brethren are true pioneers, unafraid of adding a little cutting-edge technology into our courtship rituals. The newest entry in this category is an app with a serious kawaii twist that gives flirtatious music-philes a new way to connect. 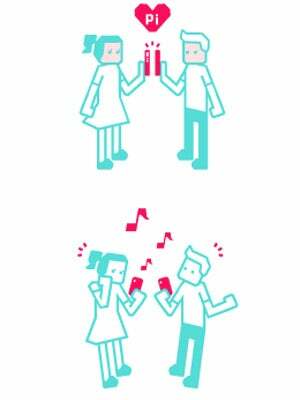 By downloading "ChuChu Tune" (which, according to Google, means "kiss kiss") on both your own and your paramour's iPhones, you can test your potential based on musical tastes. What it actually does, in reality, is run through your library to see if you have any matching songs. The more matches you have, the higher your compatibility is. Not rocket science, but the app's directions require you to push both phones together, as if they were kissing. (It also suggests this is a good time "to touch hands.") The method is simple, but we can see how finding out that both you and your crush have a serious affinity for Control-era Janet will only take things to the next level.